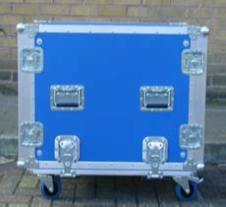 VCS flight cases are extensively used in a wide range of industries and markets, including Audio Visual, Music, Lighting, Broadcast, Medical, Information Technology, Test and Inspection, Roadshows, Sport and the Government. VCS’s cases are individually designed to meet the needs of your equipment either on tour, in house or in difficult transit conditions. To ensure the best possible designs we liaise closely with our client to determine the nature and fragility of the equipment, how the equipment is to be transported and how the equipment is to be used on site. By offering a complete and personalised design service for flight cases and transit cases, VCS can build a case that is functional, practical and tailored to suit your precise requirements. 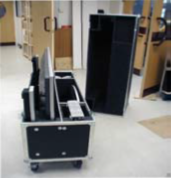 We also offer a range of standard hand-built flight cases and transit cases to match your storage and transport needs. 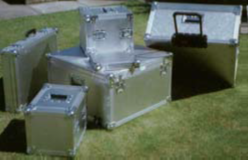 Our flight cases and transit cases are used by the Emergency Services, the Military, Sales & Demonstration organisations, Sports teams, Travelling Theatre Companies, Field Equipment companies and Equipment Hire companies to name a few. 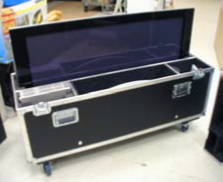 Custom Built Flight cases are made to order in a range of colours and finishes using ultra lightweight "Astraboard". Aluminium extrusions and hardware are then added to ensure the protection of its contents. Case interiors can be designed to absorb shock based on the characteristics of the equipment being carried. A variety of different interior padding materials are available, with the most commonly used being a high density Plastazote foam which can be routered to the shape of the equipment.